The Pink Bottle was more than enough reason to fire up the old blog and review our first beer in over a year! Rogue is notorious for their creativity when it comes to microbrewing. As far as I’m concerned, the Bacon Maple Ale takes the cake creativity wise… but is it actually good? Poured into the official Beer Corner beer sampling mug at fridge temperature! Pouring: Pours smoothly, but activates the ridiculous aroma of the concoction. Poured to induce formation of a small foamy head, as it appeared that it would not have happened without help. Smell: Strong smell of maple, with less intense bacon and smoke. Definitely a unique smell among the beers I have had in my life! Sounds: The usual sound of a pour. No extreme sounds of over carbonation, light bubbling with head heard. Sights: Nice slight dark orange color, almost like copper. A slightly smaller than fingertip white head appears, but quickly subsides, minimal lacing. Taste: The sweetness of the maple is the first to hit, followed by hints of bacon. However, it is overpowered by almost extreme smokiness. And it stays with you as a nice smokey aftertaste. It does detract from the experience. Overall: I enjoyed this beer, though I’m trying to decide if it’s merely a novelty for me, or if it’s something I would hop on if it we at a bar. I certainly is better than a “one-timer” in my opinion, but then again, the smokey aftertaste does make it a less than desirable beverage. I again have to give it to Rogue for their creativity, and for actually delivering on what may seem as a gimmicky beer! 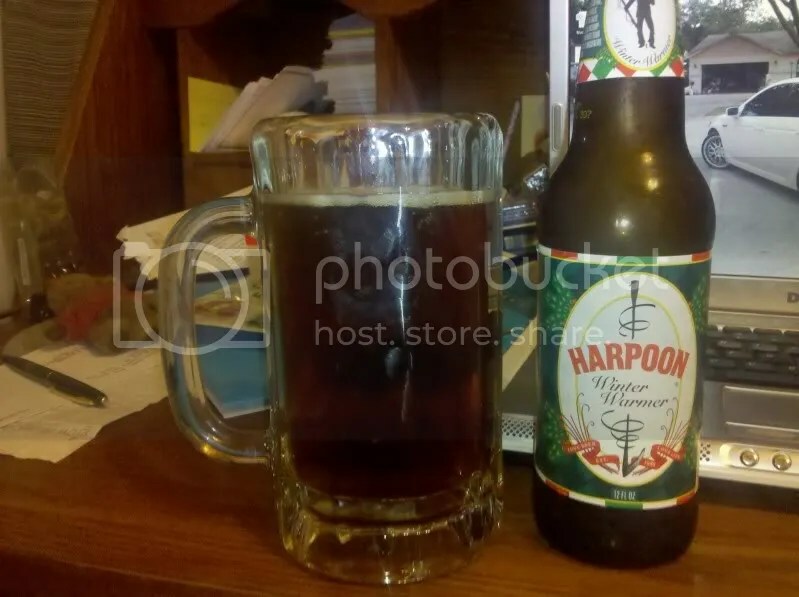 The second beer from my winter season pack is Harpoon Brewery’s Winter Warmer. I picked this one because it was of course, seasonal, and I had never tried anything by Harpoon. Poured into the official Beer Corner beer sampling mug at fridge temperature! Pouring: Slightly heavier pour, but pours relatively smoothly. I poured it a bit aggressively to see the emergence of a head. Head did form but did end up receding. Smell: Almost immediately you can smell cinnamon and nutmeg. Can make out alcohol notes as well. Sounds: Decently carbonated, and a fingertip head does form. Slight bubbling heard. Taste: Spice, spice, spice! This beer is reminiscent of Fall ales with pumpkin and other spices. The beer is rather uniform, cinnamon spice from start to finish. Slight bitterness, but mostly a nice zing of spice. Overall: I thought this beer was pretty good! There don’t seem to be favorable reviews of it on beer enthusiast sites, but to me it was enjoyable and drinkable. Perhaps it has to do with the lack of complexity. The taste doesn’t change mid sip or mid beer. It is straight up spice throughout. I am, however, confused by the “warmer” tag in it’s title. It hardly causes a flushing, if any sort of reaction. It does taste like a nice warm cider, which is perhaps why. So overall, I think it is a solid choice, and better than what you may read about online. Give it a try! 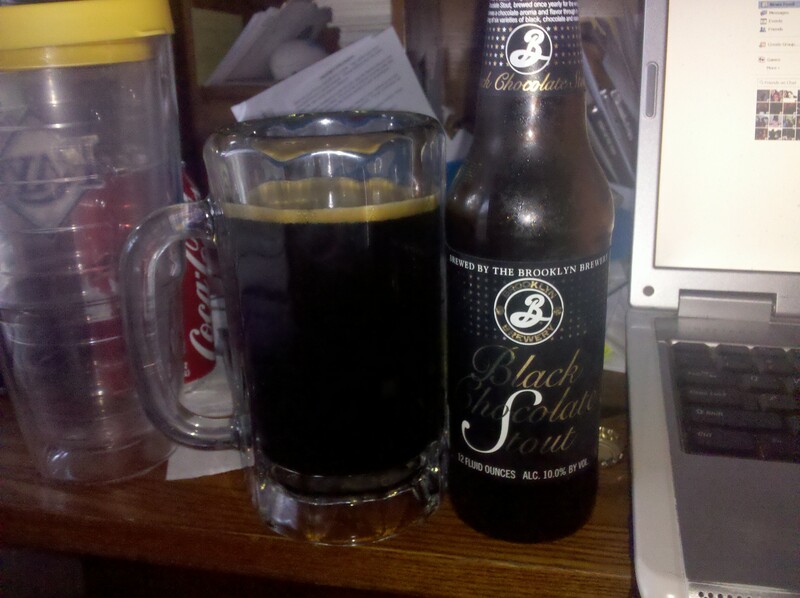 The newest review for The Heap’s Beer Corner is Brooklyn Brewery’s Black Chocolate Stout! A seasonal concoction made only in the winter. I saw this beer while scouring the shelves at Total Wine and thought it would be neat to try. I’ve had a few chocolate flavored beers, and they were nothing to write home about, so I wanted to give this one a change. Poured into the official Beer Corner beer sampling mug at fridge temperature! Pouring: A heavier than normal pour, and you can notice the chocolate and alcohol aromas. A light brown creamy head forms, about half an inch thick. Smell: Chocolate smell very noticeable and pleasant, but you can also smell the alcohol, which is not too distracting. It smells pretty good for a beer with a 10% ABV! Sounds: It’s a heavier pour, and the beer is rather silent because of it. The head appears after the beer settles a bit, sounds are minor, if any. Taste: Chocolate was pleasantly noticeable in comparison to other chocolate stouts I have tried. The sweet and slight bitterness of the beer was very enjoyable. I was expecting a slight chocolate taste and was surprised that I could actually make the taste out instead of t being lost in a heavy head. Overall: Turned out to be a great find! I almost bought another one when I went shopping for another custom six pack yesterday. It’s a shame it’s a seasonal beer. Be careful with its 10% ABV! It tastes decently light, but I’d imaging that knocking back a few could cause trouble! From start to finish, a great holiday beer, and a nice conversation starter! 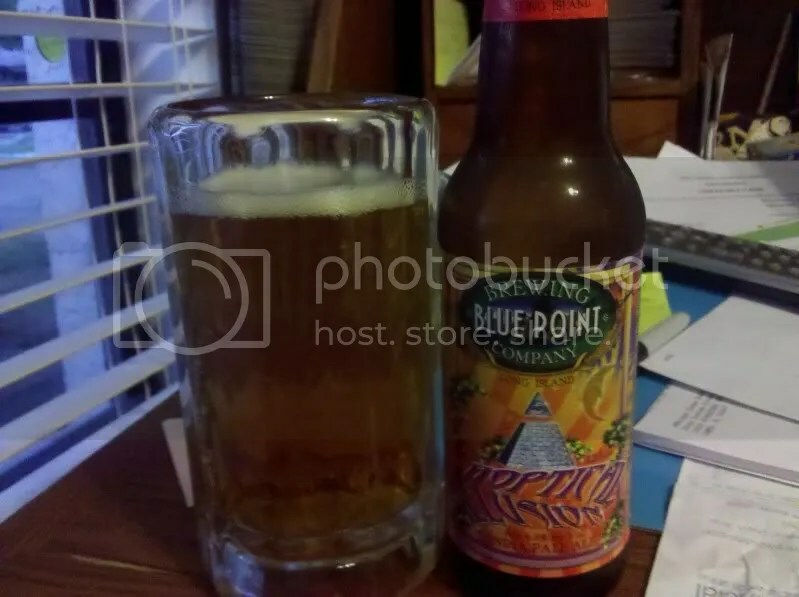 The newest beer I tried out for The Heap’s Beer Corner is Hoptical Illusion, an India Pale Ale (IPA) by Blue Point Brewing Company out of Long Island, New York. This beer was chosen because I wanted to try out a different IPA, since I do enjoy that style of beer. As usual, poured at fridge temperature into my official beer tasting mug! Smell: Slight hoppy smell noted, but actually seems to dissipate. The normal aroma of beer, nothing special. Sounds: A foamy head forms, and you can hear it if you put your ear to it. Beer sounded normally active for a beer that forms a head. Sights: A white foamy head of 1cm forms, and dissipates away as you drink. Color is a light amber, and beer is translucent. Also appears active, as you can see a lot of bubbles emerging to the top! Taste: Was quite noticeably bitter at first taste. Decently smooth, but lacking the slight creamy texture of other favored IPAs. Left an undesirable aftertaste. Overall: This beer did not offer the greatest experience… I was looking forward to trying this one since I do like IPAs, but it was just a bit too bitter for me. Probably the first beer in a long time that I struggled to finish. I did not enjoy it at all, but I will make it a point to give Blue Point another chance when I go to restock in the next few weeks. Would not buy again. 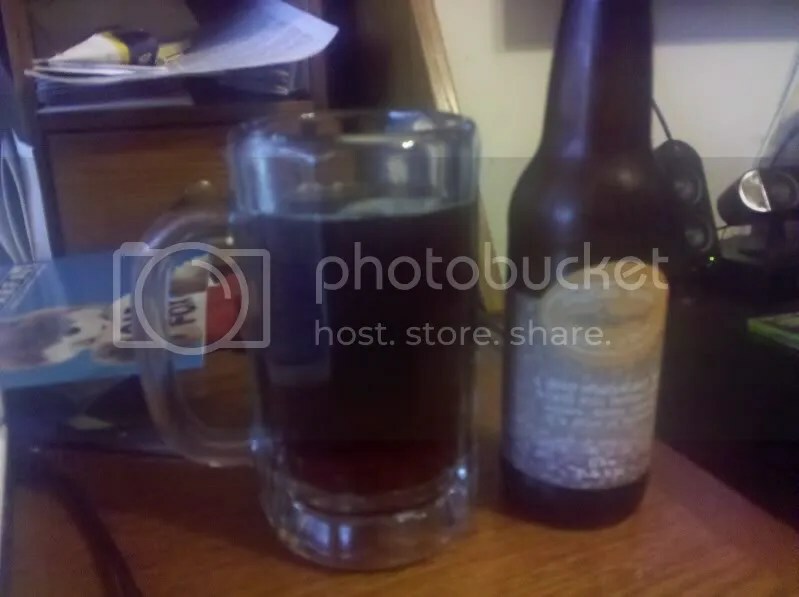 The newest Beer Corner review is of Dogfish Head Raison D’Etre! This beer was chosen because I am a fan of the Dogfish Head IPAs and I wanted to try something else they crafted. Served from a refrigerated bottle into my official review mug. Smell: Distinct smell of raisins fill the air and is quite powerful. I was not close to the mug and could smell it. Was quite surprising. Sights: No head forms after poring. Color is a robust brown, and is fairly transparent. No noticeable particles in liquid. Taste: Like the color, it is very robust. You can easily taste the raisins. Sweet at first, moderate and enjoyable taste of alcohol, hint of a bitter aftertaste. Overall: I love the DH IPAs (60 min and 90 min) and as I stated above, as interested in a different style of crafting from this brewery. It certainly was not what I expected (in a good way) and I was very surprised and how enjoyable the beer was. The raisin smell is surprising and strong. At first I couldn’t figure out what I was smelling, and then realizing it was the beer I just poured! An effort that would make the Belgians proud! Delicious. Would buy again. Have to appreciate the beer’s “wordplay” with the name (The French “Raison” pronounced closely as raisin) Also, at 8% alcohol by volume, a nice little buzz. Welcome to The Heap’s newest segment, The Beer Corner! I’ve always been a beer lover, and I’ve come to learn about an appreciate all different types of beer and its intricacies such as appearance, taste, smell, and so on. In town, we have a few stores that carry different craft and imported brews. One In particular, Total Wine, has literally an entire aisle of single bottles of beer! So what I will do periodically is go and “create my own custom six pack!” Thus, since trying new beers is sort of a hobby, why not blog about it, right? 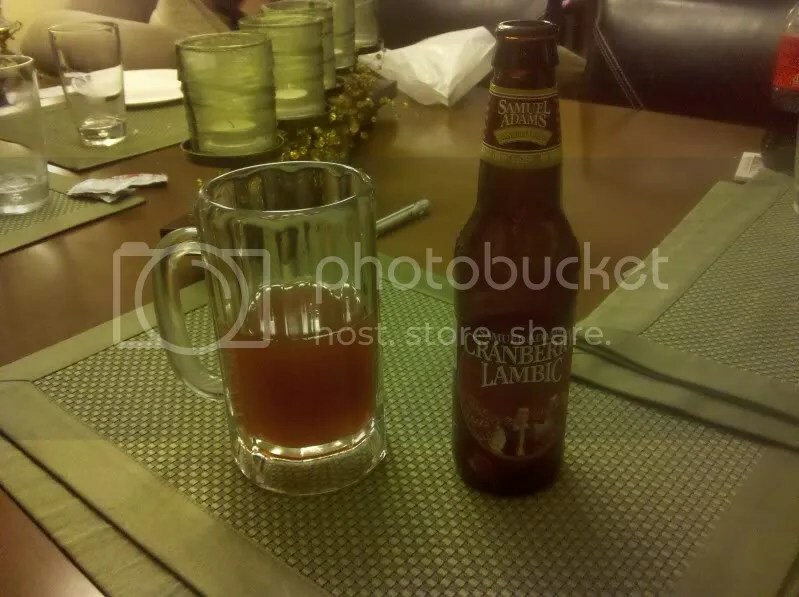 Our first review is Sam Adams Cranberry Lambic! Our first sampling actually occurred as an accident. I had initially bought this beer for my girlfriend (since she isn’t a fan of beer, but likes fruity ones!). She ended up not liking it so I had to drink the rest! The beer was refrigerator temperature and poured from a 12 oz bottle into my official Beer Corner mug (unfrozen). Pouring: Pours smoothly, and you can notice the hint of fruity aroma while the mug fills up. Almost no head forms when poured. Smell: Once poured, you can smell a cranberry aroma, but also, there is a more than expected scent of alcohol. Sights: No head forms after poring. Color is reddish and beer is cloudy with noticeable particulates. Color is not as prominent as expected or experienced from other lambics I’ve tried. Taste: Textbook Sam Adams Taste (hint of bitterness), Cranberry taste is not as strong as experienced in other lambics. Alcohol taste is much more noticeable and borderline overpowering. Minimal aftertaste. Overall: It was an enjoyable bottle of beer. While lambics aren’t usually my cup of tea, Sam Adams’ venture into this Belgian style is commendable. I think it could have used more of a fruity taste, and maybe more of a reddish hue to really give it more of an authentic look and taste. Probably not something I’d crave or by a six pack of in the future. This story I’m about to share is a real shame. Thanks to Jose Alfredo Gonzalez for posting a link on Facebook, which can be read entirely by clicking here. Polito’s a beloved restaurant for domers and South Bend townies alike burned down! The cause of the fire, according to the WNDU article is unknown, and no was was killed or injured. This, of course, is not good news to the soon to arrive students, as Polito’s was a quite popular destination for RA’s section dinners. Also, many students (my self included) would take their parents there to have a meal, as it was a unique South Bend entity (and not another average restaurant chain!). It most often served as a nice guys night out place (when we were motivated enough to ACTUALLY venture out into the real world for dinner at a decent hour) as they had excellent pizza, and cheap beer. 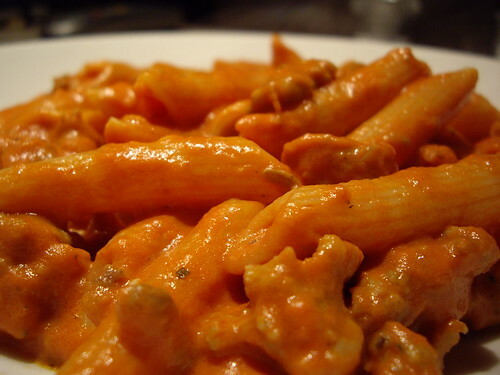 Perhaps Polito’s most endearing item on the menu HAS to be their homemade Vodka Sauce!. It pretty much went with anything, but really hit the spot on pizza crust. I was looking forward to hitting up Polito’s when I went back to visit! What a shame!